Welcome to part three of the four part series breaking down the latest additions to my cookbook collection, Lemons, Cucumbers, Honey, and Strawberries from Short Stack Editions, short form, ingredient-specific cookbooks. On the last episode of Under the Parrot Umbrella, we solved the world’s problems and answered the age old question: is there good way to bake a cucumber? Answer: no. This week, we tackle honey. Which is appropriate because today, I’m pretty sure I had the hardest workout of my life. But I don’t know that’s saying much. Aside from a short window in grad school, I’ve never been much of a runner, instead preferring a steady and forceful stroll. My friends actually make fun of me when I find myself running because my technique is more of a horse-prance. Come to think of it…is there such a think as dressage for humans? Because I think I just found my niche. And when I was a dance class regular as a child, I won “best smile,” as opposed to best anything else that has to do with dance. Middle school gym was a horror. One of my teacher volunteered me during our track unit to demonstrate jumping hurdles. What I did instead was show the class how to knock every one of those hurdles over because I was a child who won best smile in dance class. You think that’s a child that’s good at methodical jumping? In college, my finest fitness class performance was jazz aerobics, so there’s that. But this week, I boxed, and it was amazing but rough. Fitness week, a week where gyms around town offer special promotions and free classes, just wrapped up. I had grand, but unfulfilled intentions of visiting no fewer than five gyms, but I slept through and forgot about the classes at all but one. Which is more than zero though, so….I think I’m doing pretty well. On Thursday night I attended an intro to boxing. My exact review I texted my mom and sisters after was, “IT WAS AWESOME.” It was 95% women who wanted to learn a new skill and would encourage each other and cheer each other on. There were also two guys who very earnestly made Mortal Kombat style fighting noises whenever they were punching. It was all I could do not to respond with “Pew! Pew pew! Pew!” with each of my punches. It was free promotional Intro to Boxing class, guys. Calm down. I tried another boxing class this morning. It packed more of a……punch. No, but really. It was brutal. Awesome, but hard. And when it was all said and done, I hobbled my way next door to my favorite local coffee shop, and collapsed at a table, trying not to yell for a breakfast sandwich the way people on television yell for doctors in the emergency room. I needed to replenish. Obviously my first instinct was a breakfast sandwich for reasons that are cheese, but there’s a chance I could have done a better job with some electrolytes. Which brings me back to switchel. And guys. I’m officially not going to feel bad about what I’m about to type. Switchel is really interesting! This drink, the typical recipe consisting of water, ginger, vinegar, and a sweetener (molasses, honey, or syrup), is an all natural way to replace electrolytes that dates back to colonial America, it’s predecessor oxymel, a drink of water, honey, and vinegar dating back to the fifth century. It was the drink of choice of farmers, the Amish, and, naturally, Congress! Because of the close quarters and lack of air circulation in earlier congressional buildings, there was always a large bowl of switchel on hand. Though they added rum to theirs. They say that. All the time. Mix the honey, vinegar, ginger, and lemon in the mason jar. All in all, I could see how this is probably not a drink I will have all the time. It’s an acquired taste, but once acquired, this would be a nice drink to have when you need to rehydrate! And all in all, I liked Honey by Rebekah Pepper! It might be my favorite so far! I’ve already been crunching the numbers trying to decide when to have the honey-sesame bacon from her “Little Bites” section. And then I’ve been trying to decide who I can swindle with promises of compliments and cheese to make me the roast chicken with lemon and pink pepper honey butter. And then there’s the honey malt ice cream recipe. Guys, Honey is winning this race. Coming soon and bringing up the rear: Strawberries! Every Saturday morning, I get up early. I throw on some semi-respectable jeans, as opposed to my jeans that pick their nose and non-ironically like Kevin James. And I go to my county’s farmers’ market. Walking through the market with a cup of coffee and an episode of my favorite podcast is one of my very favorite things, and one would think I’d be better at it by now. One would think after all the times I’ve left the grocery store with a seven layer taco dip, biscuits and gravy flavored potato chips, three boxes of Kraft macaroni and cheese, a jar of crunchy peanut butter, and a mango just because I was slightly peckish, I’d know that you should never go food shopping without a plan. But I don’t know that I’ve ever been to the farmers’ market with any idea of what I’m looking for. You guys. I think it’s happened. I think that it could maybe have possibly happened. As I type this I’ve checked the ten day forecast three times because I don’t want to jinx it, but I think we’re here. After Winter had to get in a couple more storms, after my new tires needed to flex their muscle on the icy-slush covering the roads, after I pulled my warm-weather clothes out of storage, just to keep them in their Rubbermaid container in the middle of the floor because I pulled them out too soon, it’s here. I think it might be Spring, you guys. I won’t lie to you. This Winter was a nail-biter. Would I make it? Or would I go screaming into the night because I couldn’t face another night getting my exercise in by walking laps around my parking deck because it was a literal two degrees outside, only to be found the next morning mumble-singing “Vacation” by the Go Gos? Well, I think I made it! Good thing I was so cool and level-headed about the whole thing! Progressively over the last month, in a desperate attempt to bring nature back to my life because Nature herself was surprisingly obstinate, I’ve slowly been building an indoor plant collection, but because my apartment only has one entry-point for sunshine, prime territory for photosynthesis has gotten kind of crowded. 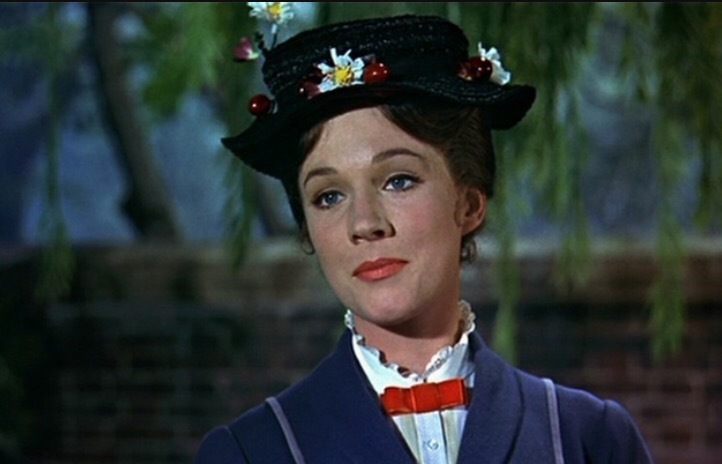 For a blog whose name is rooted in her accessory collection, we don’t talk about Mary Poppins very often. Or at all? Yeah, I don’t think she’s come up. Which is weird because she’s my favorite. She’s the best. I don’t remember why I fell in love with Mary Poppins, in the same way, none of us remember why we thought tapered stirrup pants were a good idea in the 90s. But there was a moment where we found ourselves wearing stirrup pants, and there was a moment when I was head over heels for Mary. I loved her songs, her clothes. Her carousel horse was easily the best one. She could fly. She could dance. She could jump into sidewalks! She had tea parties on the ceiling! That’s the best place for tea! There were scenes I didn’t understand till I was older, but I don’t think you were meant to understand everything about Mary Poppins. She danced and sang with toys, animals, cartoons, and chimney sweeps. I loved her so much that I would prance around and talk in a “British accent,” that was mainly just me jumping octaves as I spoke, toting a pink vinyl Minnie Mouse umbrella imagining there was a parrot at the end giving me sass. But this year, has felt very much like gardening and less like being pleasantly surprised when it rains and things grow. Regardless of this improvement, for the four years I’ve had the space for a container garden, I’ve always felt like there was a distinct point in the summer where the plants revolt. The tomatoes get sick. The dahlias stop blooming. The strawberries start invading nearby pots because that’s a thing that strawberries do, evidently! It’s like they know that all I’ve got going for me is my comfy pants collection and killer singing voice. Gardener schmardener. Truth be told, It’s almost September. Which means it’s almost Fall. Which means it’s almost the season we don’t talk about. Which means my patio garden is probably starting to wind down. Which means I was all the more surprised when I noticed my lone okra plant starting to do something. Also note the invasive strawberry, which happens to be my street name. I planted the okra months ago in a pot shared by my snap pea “crops.” And due to some faulty netting and some chipmunks who need a chipmunk tailor because they are too big for their chipmunk britches (this sentence was worth it), the pot was gutted. 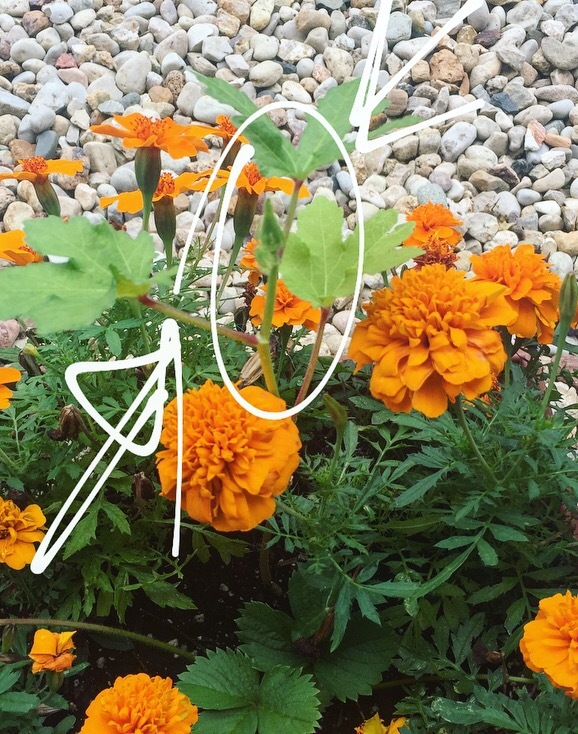 I thought nothing was coming back, so I let the marigolds take over.